From ancient rock art tours to art classes and top-end dining utilising native ingredients, to walking tours and sleeping in the rainforest, immerse yourself in Indigenous Australia, the North Queensland way. For fabulous food infused with native flavours head to Ochre, which snatches pole position along the Cairns waterfront. Launch your dining experience with wattle seed damper, dukka and macadamia oil before you select from platters of game meat, Australian delicacies or seafood. Or choose from an entrée menu including salt and native pepper leaf croc and local prawns; or red claw yabby with lemon myrtle fettucini. Discover the likes of char-grilled kangaroo sirloin with quandong chilli glaze; and wallaby topside with Daintree vanilla and wattle seed jus for mains; and desserts of wattle seed pavlova; Davidson plum mousse; quandong brulee; and local cheeses. Rock art featuring the Giant Horse. Seen during Jarramali Rock Art Tours. To experience Australia’s newest tour of the world’s oldest art join Kuku-Yalanji man Johnny Murison of Jarramali Rock Art Tours on a two-day journey near Laura. Two years ago, Johnny and his cousin stumbled across a gorgeous gallery on the lands of their ancestors. Now, Johnny offers ‘comfortable camping’ on the site which features paintings of the Quinkan spirits, among a host of other Australian animals. This earthy experience also includes story-telling, campfire cooking and star gazing. For those who are time poor, there’s even a chopper option, landing right outside the loo with the view. Indigenous rock art viewed during Jarramali Rock Art Tours. Chargrilled squid, burnt eggplant, ink crumpet, nduja salami with smoked yoghurt from Harrisons Restaurant. What does a British chef who worked in a London Michelin-star restaurant with Marco Pierre White have to do with Australian Aboriginal culture? Spencer Patrick, who spearheads Harrisons at the Sheraton Port Douglas, takes his English roots and marries them with native ingredients. Think sesame yabby toast with cocktail sauce; chargrilled squid; tortellini of endeavour prawns; and North Queensland Cobia Gravadlax with bush lemon curd. “In Australia, everything is brightly coloured,” he says. Not only is Mossman’s Janbal Gallery believed to be the only 100 per cent Aboriginal owned art gallery in Tropical North Queensland, but what makes this experience more interesting is that the owner, ‘Binna’ Brian Swindley, was born deaf. This Kuku-Yalanji man teaches Aboriginal art classes by lip reading his students. Indigenous dot painting in Mossman’s Janbal Gallery. At Mossman Gorge, you can join a Dreamtime Walk with an Indigenous tour guide such as Mooks, who has been walking these parts for the past 26 years. This 1.5 hour tour begins with a smoking ceremony to erase bad spirits before you enter the rainforest. Mooks, an Aboriginal healer, will explain the poisonous and non-poisonous species here. Encounter the wild native fig tree, pencil cedar and stinging nettles before arriving at the 400-year-old red cedar known as ‘red gold’ for its ability to provide shields, boomerangs, woomera and swords. There’s witchetty grubs, funnel web spiders, green ants, fresh water fish, turtles and eels in here too. Dinner is served at Silky Oaks Lodge. While not strictly Indigenous tourism products, both these properties pay homage to rainforest people of the area. At Silky Oaks Lodge, overlooking the Mossman River, swim in this crisp, croc-free paradise and dine on native-inspired food such as smoked barramundi parfait; Daintree barramundi curry; and kangaroo, before retiring to your luxury rainforest cabin. Daintree Ecolodge offers 15 eco-friendly bayans overlooking the rainforest canopy and hosts two-hour cooking classes showcasing native Australian ingredients. A real highlight of staying here is a walk through the rainforest to a sacred birthing place for Indigenous women. Only female guests are allowed to visit this pool, which was believed to heal women after giving birth. An eco-friendly rainforest bayan in the Daintree Ecolodge. 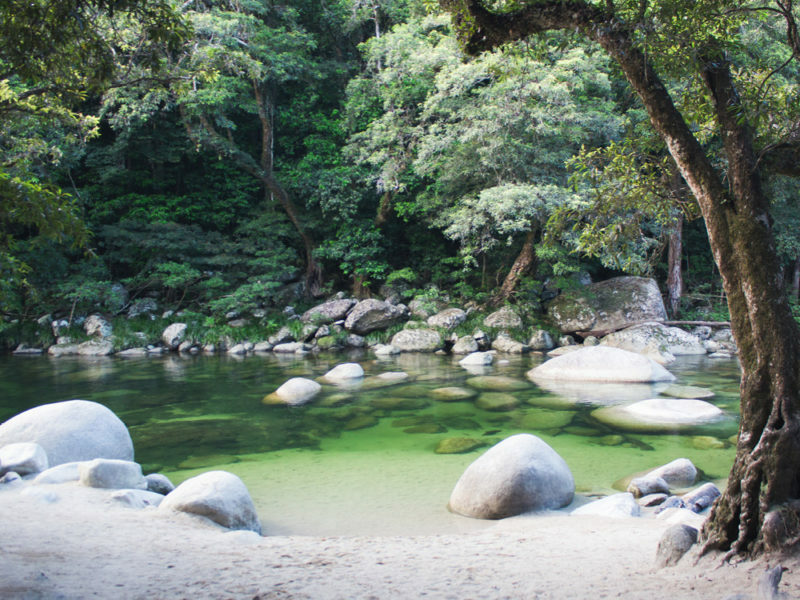 Mossman Gorge’s top pool is chilly and the colour of green tea, punctuated by huge boulders, warmed by the sun. It’s the perfect place to end a full-day Walkabout Cultural Adventures Tour with the Walker family. Start your adventure along the coast, searching for turtles. Drive north to Daintree Village before continuing along the Upper Daintree River looking for crocs. Walk through an exclusive section of the Daintree Rainforest, home to the Boyd’s forest dragon and a waterfall, before returning to the coast. After lunch at Wonga Beach, learn how to throw a spear the traditional way, before heading to Mossman Gorge for a swim. A tall, lean Aboriginal man is painted in ochre, and says his cultural name and totem is that of the wallaby. For the next 2.5 hours we follow him like wide-eyed joeys on a tour of Tjapukai Aboriginal Cultural Park starting with a talk on bush food and hunting weapons. In the amphitheatre we learn the ‘creation story’ that these rainforest people believe started when a cassowary egg was struck by lightning. In the Dance Theatre we watch – and participate in –ancient dance and singing, before heading out into the field to learn how to throw spears and boomerangs. The tour ends with a demonstration on how to play the didgeridoo. For tens of thousands of years, ancient Aboriginal people roamed by foot the Daintree, the world’s oldest rainforest. Modern-day visitors can take the Skyrail Rainforest Cableway from Cairns to Kuranda village. Soar over treetop canopies on this journey which takes 1.5 hours with two ranger-guided stops or 45 minutes if you glide straight through. At the top, explore Kuranda, the village in the middle of the rainforest, best known for its arty markets. There’s plenty of authentic Indigenous products to buy up here. To meet local Aboriginal people engaging in cultural practices, head over to the amphitheatre and you’ll bump into master weaver Rhonda Brim and a group of women, who create baskets from local grass, emu feathers and giddy, giddy seeds. Inside a stunning canopy bayan in the Daintree Ecolodge.